How would your life change if you witnessed a miracle? Watch this video, read the story below it, and then watch everything transform as you step into a world filled with wonder and surprise. Do miracles really exist? I know we all want to believe in them, but, in truth, are they real? And if they do exist, is creating miracles a divine gift given to a rare few? Maybe, in reality, creating miracles isn't something that requires years of spiritual training. Perhaps it's our natural birthright and is as easy and natural as breathing. So it is, according to Master Healer and teacher Mark Earlix. Truth be told, I witnessed a miracle the day I met Mark. Before I tell you the amazing story, please allow me to share just a little about me. I learned at an early age that our world is filled with ups and downs and we need to arm ourselves with the right psychological tools, such as courage and honesty, to get us through the down times. I have always used my honesty to help me succeed in life. When all else fails, I can say to myself that I am honest, which in turn boosts my self-esteem. Once reminded of that, off I go to overcome whatever challenge I am facing. The day began as many others, except instead of going to the office, I spent the day at a spiritual convention where Nightingale-Conant had set up a booth. Before I left that afternoon, I decided to walk the floor to see the other exhibits. It was really the first time I had ever been exposed to such a large variety of spiritual approaches. Some of them were interesting, but I thought many were flat-out weird. Then, I came across an exhibit where people were lined up. The booth belonged to a man who claimed to be a medical intuitive and intuitive healer. His name was Mark Earlix. Well, I had no idea what an intuitive healer does, so I was tempted to keep walking. But there was something calming, reassuring, and relaxing about Mark. And even though I was very skeptical, I decided to get in line to see why so many people were interested in what he was doing. When I finally reached the front of the line, Mark asked me if I had any physical issues that needed to be addressed. As it turned out, I did have a few aches and pains. And I had a pretty bad sore throat, too. But instead of showing my hand, I said, "Not really. Why don't you do your thing and see if you find anything." Without touching me, Mark raised his hands above my head, about four inches away from my body. Then, he started slowly moving his hands down. He stopped at my throat and said, "You have something going on here, don't you?" He nailed it! I hadn't been coughing or doing anything else that would tip him off that my throat was bothering me. Yet, he found it within seconds. Then he continued to scan the rest of my body. He found every little ache and pain I had. There were about three more — my stomach, my lower back, and my ankle, which I had injured in a recent backyard football game. I mean, think about it for just a second. How would you feel if someone you'd never met was able to quickly pinpoint every single one of your ailments? I don't know how it would affect you, but it moved me from skeptic to true believer in an instant. I understood exactly why all of those people were waiting to see Mark. He was a living, breathing MRI machine! I realized that, no matter how remarkable it might seem, miracles are real. And as Mark asks, "In a quiet moment, don't you feel deep in your heart that miracles are accessible to anyone who is perfectly focused on being in the moment?" "I have known Mark in many capacities for many years and know him to be an amazing healer, teacher, and intuitive. His ability to live from within spiritual realms and bring it forth for healing is fabulous and what some would term 'miraculous.' Mark knows how to work with the Spiritual Laws of the Universe and bring forth the Highest Good and Divine Perfection and how to teach others to do the same. You'll love your awakening, healing, and all the results of a profound life shift when you work with Mark." That was about 15 years ago. But the deep realization I had that day has never left me. Everyone has the ability to heal and be healed. It's NOT an ability that is buried deep inside, requiring years of meditation and exploration to tap this inherent power. The ability to heal is a simple "recognition" away. Be free of disease and eliminate discomfort. Stop sickness in its tracks before it takes hold in your body. Feel better than you have in years or even decades. Say goodbye to the dramas and traumas in your life. You'll be able to help others heal. You'll be free of stress and full of bliss. You'll experience dramatic shifts in perception. You'll understand yourself better than ever before. And you'll be free of all limitation in your life. To access this miraculous healing power, just do one thing. the moment you click into this realization, everything changes! If you ever find yourself wondering if you'll ever experience a true awakening, this is a wonderful opportunity to finally experience it. Mark is like a "spiritual tuning fork." When you're exposed to his direct and experiential method of teaching, there's a great chance that you'll resonate with his message. It's a message that has allowed thousands of people to quickly get in tune with their inherent healing power. Mark's message is really about teaching you how to have a direct and vivid experience with the unseen world. A world that is far more real than the world you see with your eyes. You'll be amazed by how easy it is to get in tune with your natural ability to heal yourself and others! Plus, you'll learn how to "direct" energy to change an outcome. Mark is a master at doing that. I know because he did it for me. After he finished my body scan, Mark asked if there was anything that I wanted to be treated for. I thought about it for a second and then remembered a promise I had made to my daughter. "Sure," I said, "I'd like to stop drinking coffee, but I crave it so much. Can you get rid of my addiction?" Mark did a quick treatment with me and sent me on my way. I didn't have a single urge to drink coffee! The craving was gone instantly. And with his new program, you'll learn how to create those kinds of instant shifts for yourself and others. Even for challenges and issues you've held on to for decades. Healing is a 'how to' process you can begin immediately! Mark has been studying, working with, and teaching healing for more than 40 years. He has worked with 25,000 to 35,000 people from all walks of life. 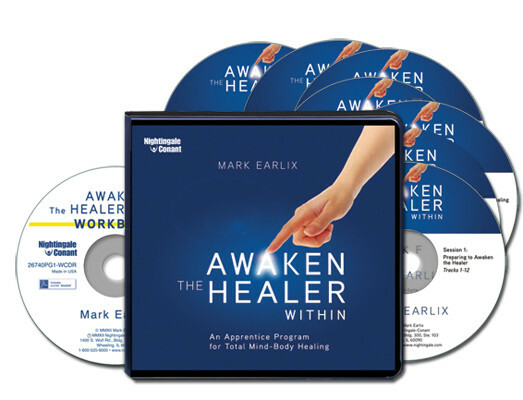 In Awaken the Healer Within, Mark walks you through a step-by-step process that helps you harness all the energy that is available in this instant. Then, with all distractions put aside, not only can you recognize what needs to be healed, but you can also use your natural abilities to manipulate energy to help heal the problem. Using this powerful cutting-edge approach, Mark has never met anyone who hasn't been able to recognize and use the universal energy that is within and around us to create a healing experience. Yes, I want to quickly tune in to my inherent power to heal. If you are stressed, worried, or ill, it's because of a negative or destructive manifestation of energy in your mind, body, or spirit. And here's where Mark's teachings can help. The reason Mark has been such a successful healer for more than 40 years is because his process allows you to move beyond meditation, mantras, and affirmations. The principle behind everything he does is simple: Feel the energy of any unhealthy or unwanted situation or condition, and then change it into something positive. After all, it is energy. In his new program, Mark explains that healing is a matter of becoming highly attuned and aware of what is going on in and around you. This high level of awareness heightens your intuition and your ability to recognize "good" and "bad" energy within a body (yours or someone else's). How to feel the pulses of energy coming from various sources around you, within you, and from the great intelligent mind of God. You will discover the areas of your body that need healing and learn how to receive information about what those areas want to show or tell you. How to identify the negative incidents that caused you to feel the way you do about things, and led you to become "who you are" today. And you'll learn how to let those incidents go so you can finally become free and whole again. How to use energy to help others heal. What destructive, negative energies feel like so that you can shift them into a good and productive energetic response. How to instantly stop a cold or flu from coming on. A simple method that helps you feel energy flowing freely between you and a partner, and then through each part of your bodies. This exercise is great for awakening the healer that is within you. There is something within that is begging you to honor it, to acknowledge it. I guarantee you'll finally recognize it after you've listened to Awaken the Healer Within. Do you wish to continue quoting others who are "enlightened" — or are you ready to be the awakened one? Self-knowledge leading to self-mastery is the ultimate quest, the pivotal adventure of a lifetime. Don't continue to live in the past or the future. You have no power there. The past clogs your mind with regret, fear, and worry. And the future doesn't exist. The answer, the right action, and the healing is in this moment. Mark is a master at helping you forget about your life situation so you can accept the gifts that are available to you right now. His teachings give your spiritual beliefs legitimacy. A belief may be comforting, but it's only through your own experience that it becomes liberating. Being exposed to Mark's work instantly changed my life. It moved me from skeptic to true believer. I honestly believe it can quickly do the same for you. I hope you'll accept this incredible offer. Nothing but good things can come to you if you do. P.S. Your life situation is mind-stuff. Your life is real. The very reason we are on this earth is to work out our perceived challenges, dramas, and dilemmas through the realization of our own power. Mark shows you that you don't have to study anything or meditate for years to do that. Awaken the Healer Within is your evolutionary catapult. Your chance to move rapidly into a significantly higher altitude where you will breathe lighter air. Be bold, step out, and go for it! YES, I want to quickly tune in to my inherent power to heal. Most of all, I want to know how to tap into my natural ability to redirect and manipulate "bad" energy into something positive. Please send me Awaken the Healer Within — including 7 CDs and a Workbook on CD - for just $79.95 - which is 70% OFF the regular program price. Take advantage of this limited-time special discount now! If I don't find this program to be life-changing, or if I'm dissatisfied with it for any reason within 30 days, I will return the program for a full refund. No questions asked.